So many lols, so little effort. 1. Give someone a frozen home screen (when they tap the apps, nothing will happen). Bonus points for using a piece of paper with Nicolas Cage on it. 3. While you're at it, Cage-ify someone's entire internet with an extension that swaps out every image for a pic of Nic. 4. "Why isn't my body wash coming out?" Plastic wrap, that's why. 5. Turn someone's iPhone apps to cats. It's easy: Just go to iPhoneception in the phone's browser. 6. Hide a toy snake around the house (or the grocery store). 7. Use autocorrect for evil. 8. Rearrange someone's drawers to seriously confuse them when they're half awake on April Fools' Day morning. "WTF? Where are my boxers?" More info here. 9. Borrow your friend's phone, change your contact name to "Mom," and start sending hilarious un-mom-like messages. 10. A prank for the Arrested Development fan in your life. 11. A prank for the Walking Dead fan in your life. 12. 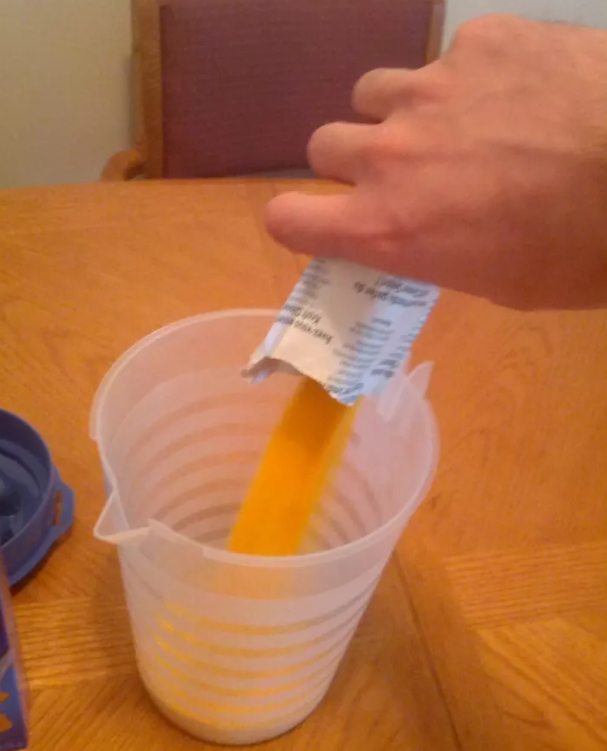 Fill up a pitcher with some "orange juice" (aka the powder from a box of mac and cheese: it's the exact same color!). 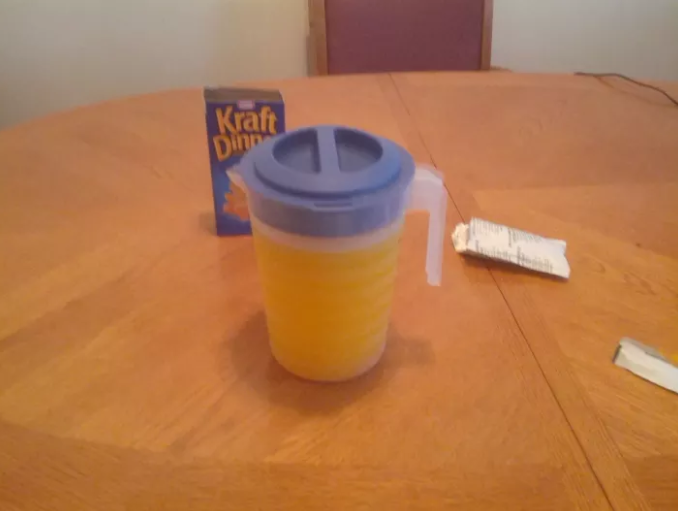 This is even more believable if you actually pour your concoction into an orange juice jug or carton. 13. Make your roommate believe that your apartment has suddenly become infested with giant bugs. 14. Squirt a few drops of food coloring onto someone's toothpaste to temporarily recolor their pearly whites. This works best if the food coloring matches the color of their bristles. 15. Wrap a rubber band around a sink spray hose for a wet surprise. 16. Most people have heard of the mayo doughnut trick by now: Try substituting ketchup for jelly instead. 17. "Sweetie, will you go fix the leak in the sink?" 18. Turn someone's water blue (or red, for a more horrifying effect). 19. Take a needle and poke a bunch of holes in the cups by the water cooler at work. 20. Print out a horrifying image and leave it in a co-worker's desk drawer. 21. Put a glow stick in a toilet paper roll and hide it in someone's closet. They'll think there's a monster in there when they turn out the lights. Full instructions at Kids Activities Blog. 23. Paint a bar of soap with clear nail polish so it will no longer lather. Full instructions by M3G here. 24. Tape a small package of pasta beneath a toilet seat: When someone sits down, the crunching sound will make them think they've cracked it. 25. Replace someone's bath mat with one that gets "bloody" when wet. Buy one here (it's available via Amazon Prime). 26. Easter candy is already on the shelves...you may as well put it to "good" use. 27. Write a co-worker's name on the waistband of a pair of underwear and then leave them in the bathroom at work. "Brie, I think you may have lost something..."
28. Work somewhere with a view of the sidewalk? Glue a quarter, five dollar bill, or credit card to the ground and enjoy the show. 29. Replace someone's deodorant with butter (or cream cheese). You'll probably want to avoid that person for the rest of the day (they'll be both angry and stinky).